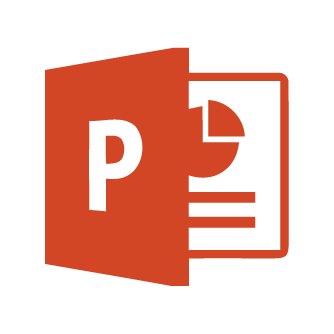 This module will teach you how to use Microsoft PowerPoint to create and design slide presentations. The links on this page will open in a new tab/window. Use a template to design your slides. Rather than starting from scratch, you can use a presentation template. You can find them in PowerPoint or on Office.com. Add notes to your presentation. You can add presenter notes in the Notes panel below the slide. When you present, only you will be able to see these notes. Add interest to your slides with images, animation, and audio. You can create movie-like presentations in PowerPoint by adding images, animations, music, and narration using tools from the Ribbon. Reuse a slide from another presentation. If you have a slide in another presentation that you want to use in your current presentation, you can import that slide rather than recreate it. Use Slide Sorter view to reorder slides. Slide Sorter view will display thumbnails of each slide, which you can drag and drop into the order you want. Check out some of the online tutorials available on Lynda.com - open in a new tab for essential training in Microsoft PowerPoint. If you are attending an Ontario college, you can log in using your college credentials. These guides are for Microsoft PowerPoint 2016, and may not be applicable for other versions of PowerPoint. For guides on other versions, see the tabs above. These guides are for Microsoft PowerPoint 2013, and may not be applicable for other versions of PowerPoint. For guides on other versions, see the tabs above. These guides are for Microsoft PowerPoint 2010, and may not be applicable for other versions of PowerPoint. For guides on other versions, see the tabs above.